This round up has 24 Summer Drinks recipes which includes both alcoholic and non-alcoholic drinks – from milkshakes to refreshing cocktails ! 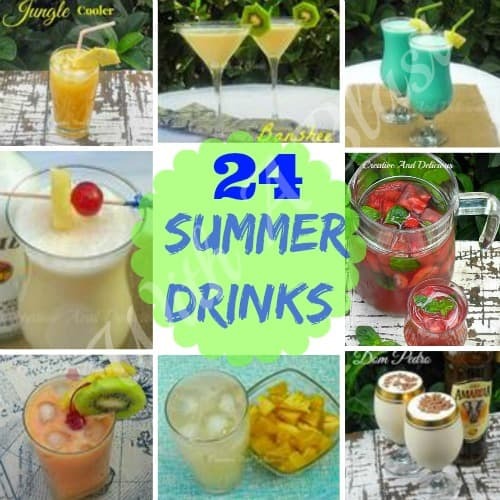 Today I am sharing a collection of 24 Summer Drinks. Here you will find just about any kind of drink recipe – some with variations, others are straightforward. A couple of these drink recipes are traditional South-African drinks. And I do hope you will check them out as well, if you are not very familiar with South-African recipes, of course. The collection consists of Milkshakes , Punches , Smoothies , Cocktails (both Alcoholic and Non-Alcoholic), drinking Dessert recipes , Iced Tea and much more. I hope you enjoy the round-up and find a couple of new favorites as well ! Cold weather ? Check out these warming drink recipes ! Well I did mention you were the cocktail queen, here's the proof!